In part 2 of my South Africa series, I look at some of the exciting Western Cape wine growing districts and wine producers cropping up on our liquor board shelfs. Click here for a map of the Cape winelands (courtesy of Wines of South Africa). The majority of South Africa’s vineyards are situated in the Western Cape, in proximity to the coast whose cooling influence tempers the otherwise baking hot growing season. This results in good acid retention and balanced wines. Value priced offerings will often be labeled under this large, generic region or the sub-zone of the Coastal Region. These wines can be blended from across their delimited territories. ELGIN: Attractively aromatic whites and vibrant light reds flourish here due to the combined cooling influence of southerly winds and moderate elevation (350 metres above sea level). Elgin lies in a basin of the Hottentots-Holland Mountains, south-east of Stellenbosch. Chardonnay, Riesling and Sauvignon Blanc make up the bulk of white wine production, while Pinot Noir and Syrah account for much of the red wine. Paul Cluver is an excellent, mid-sized Elgin producer making consistently high quality, good value whites and reds. STELLENBOSCH: Likely the best-known district of the Cape Winelands, wine production in Stellenbosch dates back to the 17th century. Less than one hour’s drive due east of Cape Town, the terrain here is mountainous with sufficient rainfall and well-drained soils. While a wide diversity of soil types and mesoclimates exist (owing to the varying exposition and altitude of plantings), many of the most prized vineyard sites lie on ancient decomposed granite or sandstone beds. The climate is generally hot and dry, with cooling afternoon breezes from the south-east. Cabernet Sauvignon is king here, though Pinotage, Syrah, Chenin Blanc and Sauvignon Blanc are also produced in abundance. Over 170 wine producers call Stellenbosch home, and trade continues to flourish. Among the many excellent wineries, Rustenberg, Glenelly, Vergelegen produces good, mid-range to premium priced Bordeaux Blends, Waterkloof for fantastic, biodynamic Rhône style blends and Ken Forrester for clean, consistent, good value old vine Chenin Blanc and Sauvignon Blanc. SWARTLAND: Traditionally a wheat-producing region, the Swartland (65km north of Cape Town) has been making waves on the international wine scene in recent years as the hot, new growing region of South Africa. Hot is indeed an apt descriptor, as well as dry, making hardy, drought resistant bush vines a common occurrence. The dominant soil type is shale, with pockets of granite and schist providing interesting alternative terroirs. The Mediterranean climate makes for excellent Rhône style reds. Lovely Chenin Blanc is also grown here. The excitement generated by Swartland’s star producers is largely justified. Fantastic, affordable quality can be found from the Kloof Street (from the Mullineux Family Wines), A.A. Badenhorst and Leeuwenkuil (bright, juicy Cinsault). Exceptional, premium to luxury priced wines from: Mullineux Family Wines and The Sadie Family. TULBAGH MOUNTAINS: A fairly secluded valley, inland from the Swartland, encircled by mountains to the west, north and east. Due to this unique topography, cool night time air becomes trapped in the vineyards making for chilly morning temperatures that gradually rise in the hot afternoons. Soils are quite varied making for a wide variety of styles. Only 13 wine producers reside here at present, but the acclaim of their wines speaks volumes. Traditional method sparkling wines, called ‘Méthode Cap Classique’ are gaining traction here. Syrah and Rhône blend whites are also performing well. Krone produces easy drinking, competitively priced sparkling wines, while Fable Mountain Vineyards is garnering top accolades for their premium white and red Rhône blends. WALKER BAY: This pretty district extends from the town of Hermanus on the south coast of the Western Cape, with the majority of top-rated vineyards lying in the aptly named Hemel-en-Aarde valley (meaning Heaven and Earth). The close proximity to the Atlantic Ocean brings cooling breezes that temper the otherwise hot climate. Clay-rich soils bring a firm structure to the wines. I spent many a happy month here, working harvest and sampling my way through the vibrant, juicy wines of the region. Chardonnay and Pinot Noir are the star grapes of the area, though Sauvignon Blanc, Syrah and Pinotage are also gaining in popularity. Hamilton-Russell Vineyards has a long-standing reputation for fine, premium Chardonnay and Pinot Noir. Bouchard-Finlayson makes very precise, focused wines from ranging from attractively fruity mid-range whites to premium Pinot Noir. Crystallum Wines regularly impresses me with their beautifully creamy, complex wines. In Canada, we are often a little late to the party when it comes to new wine trends. So, if you still think South Africa is only good for inexpensive, nondescript white wines, you are forgiven. After all, that is pretty much all our liquor boards were stocking for years. Happily, all that is changing. Read on for a three part series on the renaissance of the South African wine industry: why South Africa was typecast in a cheap ‘n cheerful role and how the industry has changed, what exciting regions to look for, and finally the people behind the wines. South African wine producers often flinch when they see their wines lumped in to the ‘New World’ wine category. Indeed, the history of winemaking dates back to 1655, with the establishment of the country’s first vineyard by then governor Jan van Riebeeck. This may seem relatively recent when compared with the first Calabrian vines planted around 1500 B.C. And it may not appear to massively pre-date the Californian and Australian industries, which both originated in the late 1700s. What makes South Africa stand apart from other New World regions in historical terms, is how quickly Cape wines rose to international prominence. While most other non-European wine producing nations saw little growth, and minimal export sales until the late 1900s, the sweet wines of Constantia were sought after by the European ruling class in the 1700s. According to the Oxford Wine Companion, Napoleon himself had the wine shipped in during his exile on St. Helena. Despite this promising start, a series of misfortunes befell South African wine growers which slowly eroded the high quality image the famed Constantia wine or ‘Vin de Constance’ had brought. Pests in the form of voracious, grape eating birds meant that many estates picked too early resulting in thin, acidic wines. The Phylloxera epidemic followed, decimating over a quarter of the country’s plantings by 1890. Partly in response to the variable wine quality and poor financial returns of so many wine farmers, a ‘super cooperative’ was formed in 1915 to bring unity and improve conditions. In short order, the KWV (Kooperative Wijnbouwers Vereniging van Zuid Afrika) became a powerful, controlling force in the South African wine industry. They were responsible for setting grape and wine prices, as well as quotas for wine production. Growers were incentivized on quantity, leading to ever increasing yields. The international sanctions imposed by the apartheid regime led to a period of isolation. South African producers were cut off from the latest innovations in viticultural and vinification techniques, and lost touch with changing international tastes and trends. With Mandela’s liberation from prison in 1990 came a resurgence in international interest for South African wines. Sadly, by this point, most of the nation’s vineyards were in a poor state. Vineyard virus was rampant. The grape varieties planted were unfashionable; mainly Chenin Blanc, Sultana and Colombard. Wine quality was, on the whole, pretty dismal. Given the often thin, reedy nature of the whites and astringency of the (under-ripe) reds, major market were only willing to buy in at very low rates, positioning the wines at rock bottom prices on shelf. This set a precedent that has proved difficult for South Africa to shake off. Fast forward a quarter of a century and the situation is radically different. The number of individual estates has more than doubled, with a growing number of small, boutique wineries commanding widespread acclaim. Massive advancements have been made in eradicating vineyard virus, reducing yields, achieving optimal ripening conditions and planting grape varieties best suited to individual vineyard sites. The European and American press have been effusive in their praise of the new wave of top quality South African wines. Neal Martin, of Robert Parker fame, has proclaimed South Africa ‘the most dynamic and exciting New World country’. Tim Atkin MW, echoes this view, calling the wines ‘world class’. In 2007, I spent a few months working the harvest at the top-rated Hamilton Russell Vineyards in the Walker Bay, and touring the wineries of the Western Cape. I saw first hand the incredible strides in quality. Carefully managed vineyards and impeccably clean wineries gleaming with modern technology were the norm. The producers we met were literally bursting with enthusiasm as they eagerly detailed their winemaking techniques and proudly poured their wines. It was a far cry from the cool, superior attitude I had thus far encountered when dealing with French vignerons. High quality South African wines now exists not only at the luxury end of the spectrum, but also in the every day, sub 15$ category. Chenin Blanc continues to dominate white wine plantings, with Chardonnay and Sauvignon Blanc also enjoying high praise. Cabernet Sauvignon and Syrah are the two top seated reds, with increasing buzz generated by the bright, fruity old-vine Cinsault and elegant Pinot Noir. Gamey, smoky Pinotage (a South African created hybrid of Pinot Noir and Cinsault) provides a unique taste profile that further sets this exceptional wine region apart. While I am loathe to place the wines of such a diverse, fast changing region into one mould, it is often true that South African wines seem to strike a stylistic balance between Old World and New. While bolder and fruitier than many European wines, they still tend to be more restrained, with greater intensity of savoury, earthy flavours than many of their American and Southern Hemisphere counterparts. Another week, another flight! Next grape up to bat is Chenin Blanc. This incredibly versatile white can be made in a range of styles from sparkling, to still (dry and off-dry), to sweet wines. This week, we are looking at entry level and premium still wines from Chenin’s two strongholds: the Loire Valley and South Africa. For many years Chenin Blanc has gotten a bad rap outside of its historic home in the Loire Valley. It is a vigorous grape that grows well in many soil types and climates. When over cropped, the wines are insipid and forgettable. In overly hot climates the grapes ripen too quickly leaving insufficient time for much aromatic complexity to develop. This was the case for a long time in South Africa, where the majority of Chenin Blanc was used to add acidity to high volume, bulk blends. Ditto in California, where plantings were highest in the hot Central Valley for jug wine production. Happily, the days of cheap and cheerful Chenin plonk are fading. More and more growers (those that didn’t pull up their vines to plant more popular varieties) are starting to show Chenin the love…and as our friends in the Loire knew already, when the vine is in balance and optimal maturity is reached at the right pace, the wines are stunning. At its best, Chenin has bright, pure fruit flavours ranging from quince, apple, honey and spice in cool climates to more ripe, tropical and peach notes in warmer areas. The palate is vibrant with bracing acidity, lots of juicy fruit flavours, light to medium body, moderately high alcohol (12°c – 13.5°c) and often a hint of sweet, tangy fruit on the finish. 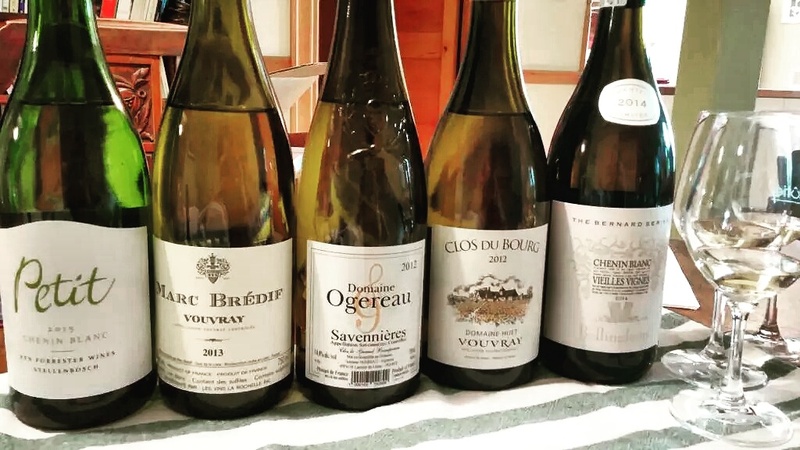 For dry to off-dry styles of Chenin Blanc from the Loire Valley, Vouvray is king (sparkling through to sweet styles are produced here, but we will look at those at a later date). The vineyard sits atop a plateau on the right bank of the Loire Valley. Dotted through the town are the most incredible, cavernous cellars, carved out of the local white Tuffeau stone (a marine sedimentary rock). The cool, continental climate and diverse soil composition gives wines with racy acidity, intense depth of flavour and lingering minerality. On a visit to see Benjamin Joliveau, viticulturalist with Domaine Huet, I had the pleasure of tasting through a vertical of off-dry and sweet Vouvray dating back to 1985. With age, the acidity mellowed, and notes of dried apricot, honey and baking spice intensified. Bone dry, brimming with juicy acidity and richly textured, the Savennières vineyard near the town of Angers, gives another expression of high quality Loire Chenin Blanc. Once considered austere and hard-edged in their youth, Savennières wine growers are starting to make more readily approachable styles. The vineyard was made famous by biodynamic wine pioneer Nicolas Joly whose wines from the vineyard plot “Coulée de Serrant” are world renowned. It is thought that the founder of Cape Town, Jan Van Riebeeck, brought Chenin Blanc cuttings over to South Africa in 1655. The grape, sometimes referred to locally as Steen, is still the most widely planted variety in the country. Dry styles range from light and fruity, to full bodied and oaked. The Coastal Region, Stellenbosch, and the Swartland are just three appellations (called WO, Wine of Origin, in South Africa) that are making noise internationally with their interpretations of Chenin Blanc. The secret to great South African Chenin Blanc, according to my dear friend and South African wine guru Pascal Schildt, is the high volume of old vines that produce rich, concentrated flavour. Ken Forrester is a highly respected Chenin Blanc producer from Stellenbosch. This everyday white is pale golden in colour with green hues. Ripe melon, guava and candied peach notes dominate the nose. Dry, light bodied and fresh with a subtle effervescence, and a fruity finish. Simple, but well-made and easy drinking, representing decent value. Restrained notes of red apple, quince, baking spices and subtle floral aromas. Bracing acidity leads into a juicy, medium weight core and a lifted, ripe apple finish. A well-balanced, linear wine that is drinking well now but shows little potential for further development. The Ogereau family refer to themselves as “vine gardeners” referring to the loving care lavished on each individual vine in their 20 hectare holdings. This heady, enticing white shows ginger, honey, quince jelly and baked apple on the nose. The bright, zesty acidity is balanced by the ample frame, but the alcohol runs a touch hot and a subtle bitterness on the finish stops this wine just shy of perfect. Biodynamic estate, Domaine Huet is one of the leading lights of Vouvray. The Clos du Bourg, one of the domaine’s best vineyards, is reputed for its shallow, stony soils giving intense minerality and generous texture. This dry Chenin has a soft, pretty nose featuring cinnamon, baked apples, honey, quince and mineral notes. Racy acidity, broad, juicy texture and lingering minerality. This was a wet, cool vintage; not the best example of this vineyard’s potential but nonetheless well-made and enjoyable. The Bellingham estate is one of the oldest in South Africa, dating back to the 1690s. This intensely aromatic white has an oak-rich crème brulée character, with tropical fruit and apricot undertones. Lively and full-bodied, with a broad, creamy texture, and a toasty finish. The heavy handed use of oak and warming alcohol throws off the balance. This week’s wine flight centres around Cabernet Sauvignon based wines. Originally from the South West of France with mentions as far back as the sixteen hundreds, Cabernet Sauvignon is a cross between the white grape Sauvignon Blanc and the red Cabernet Franc. Today, it is the most planted wine grape in the world. What makes Cabernet Sauvignon so popular to grow? It is hardy, fairly disease and frost resistant and adapts well to a huge variety of climates and soil types. Cabernet Sauvignon has a fantastic aromatic and structural range; from green, herbaceous notes with vibrant acidity and a taut frame in cooler climates to intense black currant and dark berry fruits with more moderate acidity and broader structure in warmer areas. Top Cabernet Sauvignon has high acidity, full body and firm tannins allowing for excellent ageing potential, and with that, the potential for further aromatic development, the mellowing of texture and softening of tannins. Unfortunately not all Cabernet blends from Bordeaux are that earth shattering. There are poor vintages, mediocre quality growers, lots of mass-produced wines at the cheaper end of the spectrum, not to mention the waiting game…the better Bordeaux need time to soften and develop. They are often quite green, austere and pucker-inducing in their youth. Aromas range from green pepper, graphite, violets and black currant at first, to tobacco, cedar, leather and earthy notes with age. Stellenbosch in the Western Cape’s Coastal Region of South Africa has also developed a name for itself for good quality (and value) Cabernet. Despite a fairly hot, dry climate, Stellenbosch Cabernet Sauvignon is distinctive for its herbaceous, eucalyptus aromas, restrained black currant and signature singed/ smoky notes. Dry and medium bodied like Bordeaux with similar use of French oak, but more moderate acidity and slightly higher alcohol levels. The Coonawarra is a comparatively tiny vineyard area (just 15km x 2km) within the Limestone Coast area of South Australia. 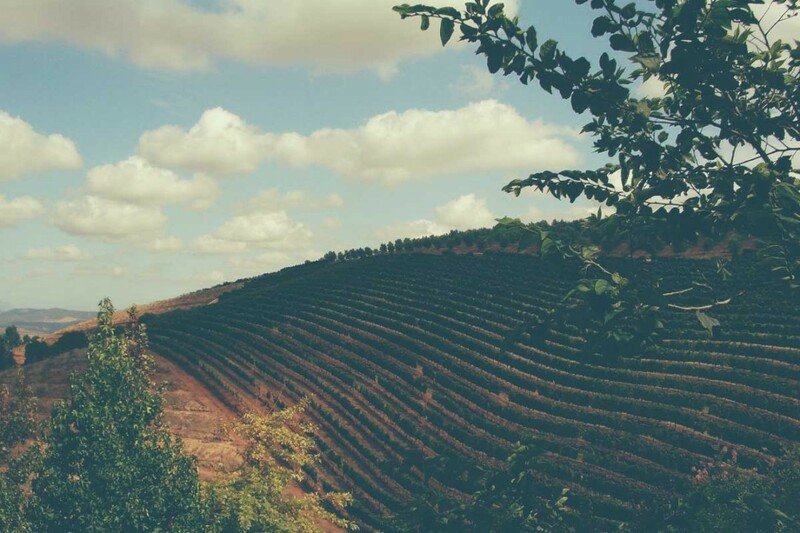 This out of the way pocket of vines is sought after due to the Terra Rossa (red soil) that has proved an incredible terroir for Cabernet Sauvignon. The wines are intensely fruity with black currant and plum notes; and lots of spicy mint undertones. Moderate to fresh acidity, full body, velvetty structure and firm, chewy tannins. Depending on the grower, oak is either restrained, spicy French or more overt, vanilla and coconut scented American. The Mendoza region of Argentina provides Cabernet Sauvignon a cocktail of high altitude, ample sun and rocky soils. The resulting wines are fresh, with an intriguing combination of power and elegance. Aromas include black currant, black cherry and plum, underpinned with sweet spices and vanilla. Acidity, body and tannin are all high here, though tend to be balanced and smooth in the best examples, with well integrated American and/ or French oak. Last but certainly not least, the Napa Valley. In a famous 1976 tasting in Paris, Cabernet Sauvignon from the famous Stag’s Leap beat out Bordeaux 1st growths in a blind tasting. Napa growers are, understandably, proud of their terroir. Cabernet Sauvignon grown here is powerful and lush. Ripe black and red fruits, soft menthol, eucalyptus notes and oak aromas dominate. The best examples generally have moderate acidity, full body, broad structure, firm, silky tannins and lots of toasty, vanilla oak on the finish. Bordeaux blend of equal parts Cabernet Sauvignon and Merlot, with ~5% Cabernet Franc. Restrained and earthy on the nose with notes of black currant, menthol, cedar and tobacco leaf. Bright, juicy acidity, medium body, firm, rounded tannins, moderate alcohol and subtle oak. Needs time or, barring that, a couple of hours in a decanter to unwind. The second wine of renowned St. Julien property Château Lagrange. The blend is 60% Cabernet Sauvignon, 30% Merlot & 10% Petit Verdot. More elegant and intense with layered aromas of sweet cherry, cassis, violet, earthy notes, tobacco and eucalyptus. Full bodied with a silky texture, vibrant acidity, very firm, fine grained tannins and well integrated oak. This prominent Stellenbosch estate on the Simonsberg Mountain was established in the 18 hundreds. The wine shows a marked green character with eucalyptus, menthol and bell pepper notes dominating the soft black fruit undertones. Full bodied with moderate acidity and grippy tannins. The juicy fruit character on the palate seems at odds with the green nose. Seductive notes of cassis, plum and dark cherry, with underlying minty and dark chocolate aromas. Good balance of fresh acidity and full-bodied, fruity structure. Lots of vanilla-rich oak aromas here. Tannins are pronounced, but ripe. Very pleasant, but no aromatic development in glass. Leading Argentinian producer Catena is hailed as a pioneer of top quality, high altitude wines in the Mendoza region. Pretty nose of ripe blackberries, tea leaf, dark chocolate, menthol and subtle cedar notes. The palate is fresh and lively; full bodied with a smooth texture, soft tannins and present, but well integrated oak. Easy drinking; great value for the price. Robert Mondavi was known world-wide for his tireless efforts to gain global recognition for the high quality of Napa Valley wines. The winery has since been sold, but the wines are still well-made. This Cab shows attractive menthol, cassis, raspberry, sweet spice and intense vanilla notes on the nose. Bright, juicy acidity is backed by a full body and firm tannic structure. It is tightly wound; needs time for the oak to integrate and the tannins to soften.